In this document we cover managing people in the Gluu Server's OpenLDAP Directory and graphical user interface "oxTrust". We also briefly cover the Gluu Server's very basic out-of-the-box user registration feature. However, when it comes to user registration, we almost always recommend writing your own registration process, then using the SCIM 2.0 APIs to register the users in your Gluu service. All the data generated by the Gluu Server is stored in the local LDAP server included in every deployment. This includes OpenID Connect client data, session data, tokens, user data, and more. 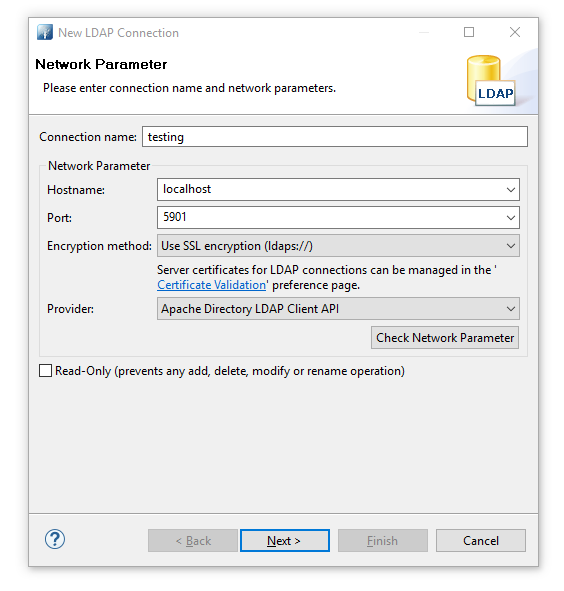 This may look slightly different if using other LDAP servers. Establish a tunnel from your computer to the target Gluu Server's LDAP. Tunneling is required because Gluu Server's LDAP port, 1636, is not exposed to the internet. 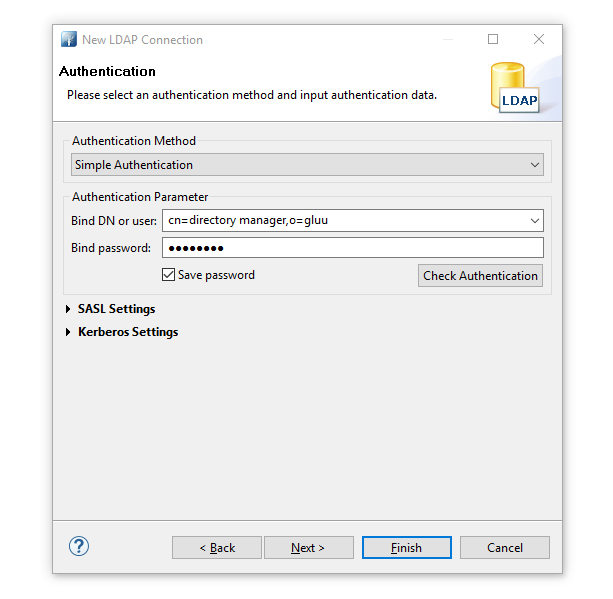 In the below example we are showing how to connect and use Gluu Server's internal LDAP server with any LDAP browser. Perform authentication. 'Password' is the the password of 'admin' user. Browse ldap and go to 'ou=people'. 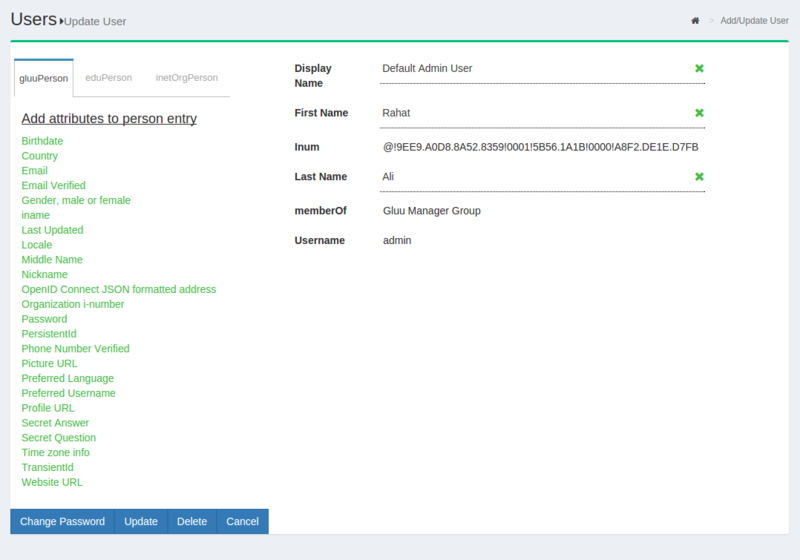 Managing data associated with people can be performed in both oxTrust, the admin GUI, as well as LDAP. To manage people in oxTrust, navigate to User > Manage People. From this interface you can add and search users. Because the user database can potentially be very large, a value with at least two characters is required in the search field. In other words, you can not click search with a blank entry to populate all users. 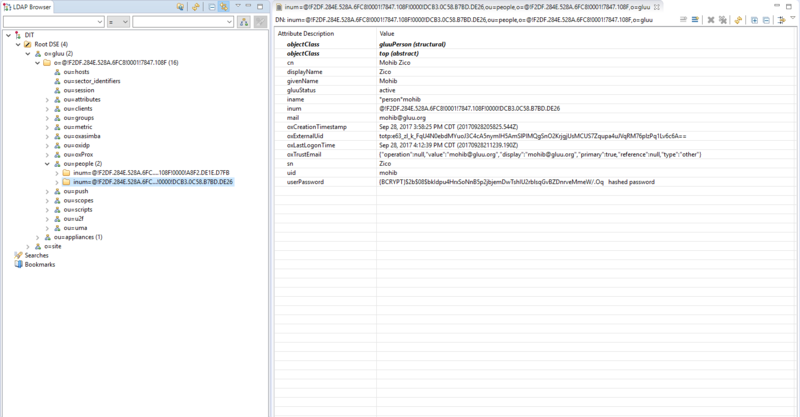 If you need to see all users, this would be best performed manually within the Gluu LDAP server. Upon performing a user search in oxTrust a list will be populated with all users that match the search. To edit a user, simply click on any of the hyperlinks associated with that user and you will be taken to a user management interface where you can modify specific attributes relating to that user. If the user has any associated Pairwise IDs, they will be displayed in a table on the bottom of the page. If an associated Pairwise ID needs to be removed, just click the Remove button. Likewise, if the user has any associated 2FA devices, they will be displayed in their own table at the bottom of the page. If an associated 2FA device needs to be removed, just click the Remove button. There can be several oxId= ... entries underneath. Every entry has the oxAuthClientId attribute, which is the inum of the OpenID client for which the user has authorized consent. To remove consent for a user/client pair, manually remove the corresponding oxId=... subentry. To also remove the refresh tokens, check the clients branch ou=clients,o=...,o=gluu. Under the oxAuthGrantId=... branch, there will be subentries for uniqueIdentifier=.... Those have the following attributes which map client, user and type of token issued: oxAuthClientId, oxAuthUserId, oxAuthTokenType. Delete the uniqueIdentifier=... entries as needed. oxAuth will also clear those automatically as per the oxAuthExpiration attribute. Out of the box, the Gluu Server includes one group: the Gluu Manager Group (gluuManager). Groups can be added and populated as needed. By using the Manage Groups feature, the Gluu Server Administrator can add, delete or modify any group or user within a group. The list of available groups can be viewed by hitting the Search button with a blank search box. The Gluu Server Administrator can modify information such as Display Name, Group Owner, Visibility type etc. The Server Administrator can also add or delete users within existing groups. The group information is represented as shown below. If any member of the Organization is required to be added in any specific group, this can be achieved be clicking on the Add Member button. The flow is Add Member --> Search the name/email of the user --> Select the user --> Click OK --> Update. Gluu administrators can import users from an excel file by navigating to Users > Import People. Click the Add button to select the file from which the users will be imported. The supported excel formats are xls and xlsx. Click the Validate button to validate the user list. Click Import to complete the import of users. Make sure to use the exact spelling as shown above. The Gluu Server includes a very basic user registration feature. Instructions for using Gluu's user registration functionality follows. In most situations, we recommend writing a custom registraton page that uses Gluu's SCIM 2.0 endpoints to send user identity data to Gluu. Using SCIM will give you more control and flexibility over the registration process. Also, since oxTrust is frequently not Internet facing, the registration page (https://<hostname>/identity/register) may not be available to a user on the web. New users will now be able to register for accounts at: https://<hostname>/identity/register. When user registration is handled via oxTrust, users can not be added to a backend LDAP or Active Directory server. This means that self-registration via oxTrust is only effective if users are authenticated by GluuLDAP (and not a backend LDAP or AD server). A limited number of attributes are present in the default registration form. If more attributes are needed they can be added via the GUI by navigating to Organization Configuration > Manage Registration. Learn how to add attributes to the default registration form. By default the Custom property (key/value) field will include the value: enable_user and true. This enables new users to login as soon as registration is complete. If you want to manually review and approve new user registrations, you can set this value to false as shown in the screenshot below.